A corset is a body covering undergarment (clothes worn under others). A corset is a garment worn to hold and train the torso into a desired shape for aesthetic or medical purposes (either for the duration of wearing it or with a more lasting effect). Both men and women are known to wear corsets, though this item was for many years an integral part of women's wardrobes. Since the late 20th century, the fashion industry has borrowed the term "corset" to refer to tops which, to varying degrees, mimic the look of traditional corsets without acting as them. While these modern corsets and corset tops often feature lacing or boning and generally imitate a historical style of corsets, they have very little, if any, effect on the shape of the wearer's body. Genuine corsets are usually made by a corsetmaker and are frequently fitted to the individual wearer. 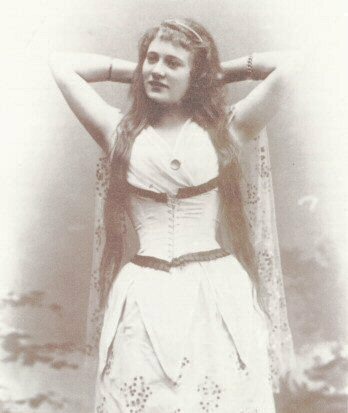 The word corset is derived from the Old French word corps and the diminutive of body, which itself derives from corpus—Latin for body. The craft of corset construction is known as corsetry, as is the general wearing of them. (The word corsetry is sometimes also used as a collective plural form of corset.) Someone who makes corsets is a corsetier or corsetière (French terms for a man and for a woman maker, respectively), or sometimes simply a corsetmaker. In 1828, the word corset came into general use in the English language. The word was used in The Ladies Magazine to describe a "quilted waistcoat" that the French called un corset. It was used to differentiate the lighter corset from the heavier stays of the period. The most common and well-known use of corsets is to slim the body and make it conform to a fashionable silhouette. For women, this most frequently emphasizes a curvy figure by reducing the waist and thereby exaggerating the bust and hips. However, in some periods, corsets have been worn to achieve a tubular straight-up-and-down shape, which involved minimizing the bust and hips. For men, corsets are more customarily used to slim the figure. However, there was a period from around 1820 to 1835 — ranging as late as the late 1840s in some instances — when a wasp-waisted figure (a small, nipped-in look to the waist) was also desirable for men; wearing a corset sometimes achieved this. Traditionally, a corset supports the visible dress and spreads the pressure from large dresses, such as the crinoline and bustle. At times, a corset cover is used to protect outer clothes from the corset and to smooth the lines of the corset. 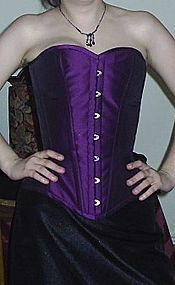 The original corset cover was worn under the corset to provide a layer between it and the body. Corsets were not worn next to the skin, possibly due to difficulties with laundering these items during the 19th century, as they had steel boning and metal eyelets that would rust. The corset cover was generally in the form of a light chemise, made from cotton lawn or silk. Modern corset wearers may wear corset liners for many of the same reasons. Those who lace their corsets tightly use the liners to prevent burn on their skin from the laces. People with spinal problems, such as scoliosis, or with internal injuries, may be fitted with a form of corset to immobilize and protect the torso. Artist Andy Warhol was shot in 1968 and never fully recovered; he wore a corset for the rest of his life. Corsets are typically constructed of a flexible material (like cloth, particularly coutil, or leather) stiffened with boning (also called ribs or stays) inserted into channels in the cloth or leather. In the 18th and early 19th century, thin strips of baleen, also called whalebone, were favoured for the boning. Plastic is now the most commonly used material corsets. Spring and/or spiral steel is preferred for stronger and generally better quality corsets. Other materials used for boning have included ivory, wood, and cane. Corsets are held together by lacing, usually (though not always) at the back. Tightening or loosening the lacing produces corresponding changes in the firmness of the corset. Depending on the desired effect and time period, corsets can be laced from the top down, from the bottom up, or both up from the bottom and down from the top, using two laces that meet in the middle. In the Victorian heyday of corsets, a well-to-do woman's corset laces would be tightened by her maid, and a gentleman's by his valet. The corset has been attributed to Catherine de' Medici, wife of King Henry II of France. She enforced a ban on thick waists at court attendance during the 1550s. For nearly 350 years, women's primary means of support was the corset, with laces and stays made of whalebone or metal. Woman's corset (stays) c. 1730–1740. Silk plain weave with supplementary weft-float patterning, stiffened with baleen; Los Angeles County Museum of Art, M.63.24.5. Corset Facts for Kids. Kiddle Encyclopedia.